Organisations need to be supported in addressing key challenges of their communities related to migration, diversity and social inclusion. 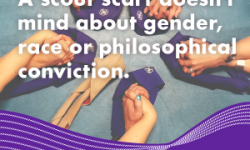 Scouting is inclusive, respecting differences in gender, ethnicity, religion, sexual orientation, disability. Our young and adult volunteers are powerful agents of social change in the world; their support is essential for their engagement in these issues. Adapting their non-formal educational programmes to be able to provide all young people with meaningful opportunities, reaching out to young people from socially excluded and culturally diverse backgrounds will be the main issues that will be tackled by the group.